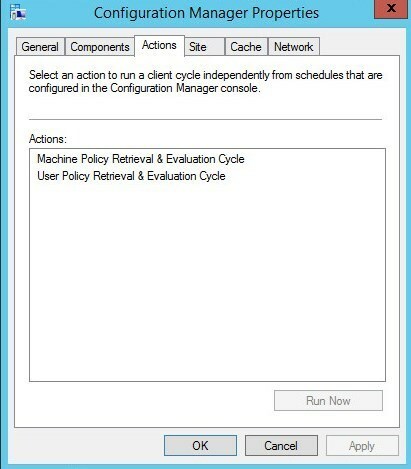 This script will check components used by the SCCM client and if an issue is found it will attempt to fix the issue. 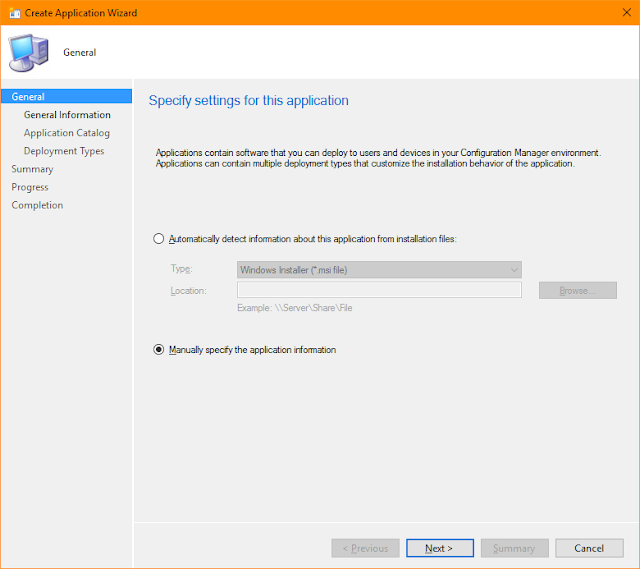 will install the client from the specified location. 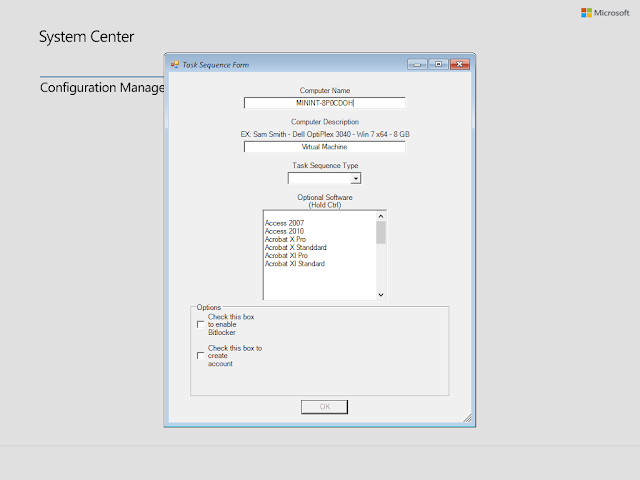 the SCCM name space is working. there are no corrupted files left behind. and if an issue is found it will attempt to fix the issue. Add-LogEntry "Starting SCCM Client Health Check" "1"
Add-LogEntry "Checking if SCCM Client is installed" "1"
Add-LogEntry "SCCM Client is installed" "1"
Add-LogEntry "WARNING: SCCM Clinet is not installed" "2"
Add-LogEntry "SCCM Client will be installed after other checks have been completed" "1"
Add-LogEntry "SCCM client install files found" "1"
Add-LogEntry "Removing old client install files" "1"
Add-LogEntry "Running SCCM Client uninstall" "1"
Add-LogEntry "ERROR: Could not uninstall SCCM Client" "3"
Add-LogEntry "SCCM Client successfully uninstalled" "1"
Add-LogEntry "Remove leftover client files"
Add-LogEntry "Running SCCM Client Install" "1"
Add-LogEntry "ERROR: Could not install SCCM Client" "3"
Add-LogEntry "SCCM Client successfully installed" "1"
Add-LogEntry "Running Machine Policy Cycle"
Add-LogEntry "SUCCESS: SCCM WMI was repaired" "1"
Add-LogEntry "ERROR: SCCM WMI was not repaired" "3"
Add-LogEntry "Checking startup type of CcmExec" "1"
Add-LogEntry "WARNING: CcmExec Service needs to be set to Automatic" "2"
Add-LogEntry "Attempting to change start type to Automatic" "1"
Add-LogEntry "ERROR: Could not change start type" "3"
Add-LogEntry "SUCCESS: CcmExec service start type was set to Automatic" "1"
Add-LogEntry "CcmExec Service startup type is correct" "1"
Add-LogEntry "Checking status of Ccmexec service" "1"
Add-LogEntry "WARNING: CCMExec service stopped" "2"
Add-LogEntry "Attempting to startng CCMExec Service " "1"
Add-LogEntry "ERROR: Could not start CCMExec Service" "3"
Add-LogEntry "SUCCESS: started CcmExec Service"
Add-LogEntry "Ccmexec service is running" "1"
Add-LogEntry "Checking startup type of BITS service" "1"
Add-LogEntry "WARNING: BITS Service needs to be set to Automatic" "2"
Add-LogEntry "Attempting to change startup type to Automatic" "1"
Add-LogEntry "ERROR: Could not change startup type" "3"
Add-LogEntry "SUCCESS: BITS service startup type was set to Automatic"
Add-LogEntry "BITS service startup is set correctly" "1"
Add-LogEntry "Checking status of BITS service" "1"
Add-LogEntry "WARNING: BITS Service Stopped" "2"
Add-LogEntry "Attempting to start BITS Service" "1"
Add-LogEntry "ERROR: Could not start BITS Service" "3"
Add-LogEntry "SUCCESS: started BITS Service" "1"
Add-LogEntry "BITS Service is started" "1"
Add-LogEntry "Checking startup type of wuauserv service" "1"
Add-LogEntry "WARNING: Wuauserv Service needs to be set to Manual" "2"
Add-LogEntry "Attempting to change start type to Manual" "1"
Add-LogEntry "SUCCESS: wuauserv service start type was set to Manual"
Add-LogEntry "Wuauserv Service startup type is correct" "1"
Add-LogEntry "Checking startup type of Winmgmt service" "1"
Add-LogEntry "WARNING: Winmgmt Service needs to be set to Automatic" "2"
Add-LogEntry "SUCCESS: Winmgmt service startup type set to Automatic"
Add-LogEntry "Winmgmt service startuptype correctly set" "1"
Add-LogEntry "Checking status of Winmgmt service" "1"
Add-LogEntry "WARNING: Winmgmt Service Stopped" "2"
Add-LogEntry "Attempting to start Winmgmt Service" "1"
Add-LogEntry "ERROR: Could not start Winmgmt Service" "3"
Add-LogEntry "SUCCESS: Winmgmt Service started" "1"
Add-LogEntry "Winmgmt service is running" "1"
Add-LogEntry "Checking startup type of RemoteRegistry service" "1"
Add-LogEntry "WARNING: RemoteRegistry Service needs to be set to Automatic" "2"
Add-LogEntry "SUCCESS: RemoteRegistry service start type set to Automatic"
Add-LogEntry "RemoteRegistry service startup type correctly set" "1"
Add-LogEntry "Checking status of RemoteRegistry service" "1"
Add-LogEntry "WARNING: RemoteRegistry Service Stopped" "2"
Add-LogEntry "Attempting to start RemoteRegistry Service" "1"
Add-LogEntry "ERROR: Could not start RemoteRegistry Service" "3"
Add-LogEntry "SUCCESS: started RemoteRegistry Service" "1"
Add-LogEntry "RemoteRegistry service started" "1"
Add-LogEntry "Machine Policy Retrieval Evaluation Action is working correctly" "1"
Add-LogEntry "WARNING: Machine Policy Retrieval Evaluation Action is not working correctly" "2"
Add-LogEntry "This will be resolved by reinstalling the SCCM Client"
Add-LogEntry "Software Update Deployment Action is working correctly" "1"
Add-LogEntry "WARNING: Software Update Deployment Action is not working correctly" "2"
Add-LogEntry "Application Deployment Action is working correctly"
Add-LogEntry "WARNING: Application Deployment Action is not working correctly" "2"
Add-LogEntry "Checking status of WMI" "1"
Add-LogEntry "SCCM Client set to be reinstalled, will not check SCCM WMI" "1"
Add-LogEntry "WMI Seems to be working correctly" "1"
Add-LogEntry "WARNING: One or more WMI classes are corrupted" "2"
Add-LogEntry "Attempting to repair WMI" "1"
$DependentServices = Get-Service winmgmt -DependentServices | Where-Object Status -eq "Running"
Add-LogEntry "Attempting to stop CcmExec Service" "1"
Add-LogEntry "ERROR: Could not stop CcmExec service" "3"
Add-LogEntry "It is not recommened to continue with WMI repair proccess, Stopping Script" "2"
Add-LogEntry "Attempting to stop winmgmt Service" "1"
Add-LogEntry "ERROR: Could not stop winmgmt service" "3"
Add-LogEntry "Attempting to stop wmiApSrv Service" "1"
Add-LogEntry "ERROR: Could not stop wmiApSrv Service" "3"
Add-LogEntry "Attempting to stop $Service Service" "1"
Add-LogEntry "ERROR: Could not stop $Service service" "3"
Add-LogEntry "All Services stopped, Repairing WMI" "1"
Add-LogEntry "Completed running the repaire process" "1"
Add-LogEntry "Attempting to restart services needed for WMI" "1"
Add-LogEntry "Attempting to restart Winmgmt service" "1"
Add-LogEntry "ERROR: Could not restart winmgmt service" "3"
Add-LogEntry "Attempting to restart winmgmt service in 10 seconds" "1"
Add-LogEntry "SUCCESS: Winmgmt service is now running" "1"
Add-LogEntry "Attempting to restart wmiApSrv service" "1"
Add-LogEntry "ERROR: Could not restart wmiapSrv service" "3"
Add-LogEntry "Attempting to restart wimApSrv service in 10 seconds" "1"
Add-LogEntry "SUCCESS: wmiApSrv service is now running" "1"
Add-LogEntry "Attempting to restart WmiPrvSE service" "1"
Add-LogEntry "ERROR: Could not restart WmiPrvSE service" "3"
Add-LogEntry "Attempting to restart WmiPrvSE service in 10 seconds" "1"
Add-LogEntry "SUCCESS: WmiPrvSE service is now running" "1"
Add-LogEntry "Attempting to restart $Service service" "1"
Add-LogEntry "ERROR: Could not restart $Service" "3"
Add-LogEntry "Attempting to restart $Service service in 10 seconds"
Add-LogEntry "SUCCESS: $Service service is now running" "1"
Add-LogEntry "SUCCESS: Standard WMI has been repaired" "1"
Add-LogEntry "Will Check SCCM WMI after client install" "1"
Add-LogEntry "Reinstalling the SCCM Client to repair the SCCM part of WMI" "1"
Add-LogEntry "ERROR: Standard WMI was not repaired" "3"
Add-LogEntry "Will chack SCCM WMI after client install however further action may be needed to further repaire this device"